AIMP2 is a feature rich Portable Freeware Mp3 Audio and Internet Radio Player. In addition to Streaming Internet Radio, this Freeware Audio Player can play audio formats such as MP1, MP2, MP3, MPC / MP+, AAC, AC3, Ogg, FLAC,APE, WavPack, Speex, WAV, CDA, WMA, S3M, XM, MOD, IT, MO3, MTM, UMX. AIMP2 key features include skin ability, plugins, audio grabber, audio converter, recorder, 18 band eq, playlist and more. 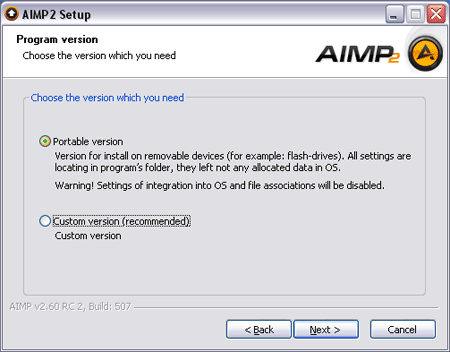 AIMP2 is available in most languages and is considered by many to be a better audio playing software alternative than Winamp.